Okinawa's 2016 beauty queens, Anna Okuhama (from left), Kumiko Morita and Yuka Shinzato, on November 8 at the Okinawa Convention Center in Ginowan. An event to crown the 2016 Miss Okinawa was held hosted by the Okinawa Convention & Visitors Bureau (OCVB) on November 8 at Okinawa Convention Center in Ginowan. Anna Okuhama, 23-year-old vocational school student from Ginowan, won Miss Sky Blue, Kumiko Morita, 22-year-old travel company employee was awarded Miss Cobalt Blue and Yuka Shinzato, 27-year-old advertising agency employee, became Miss Clean Green Gracious. 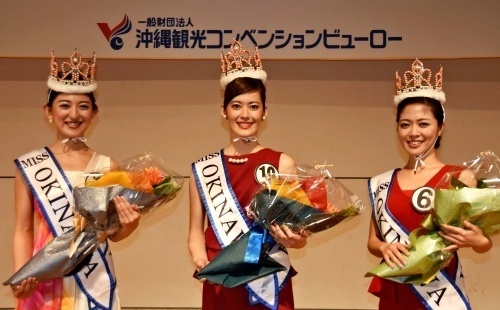 The three beauty queens will take part in events to promote Okinawan tourism from January next year. “I would like to promote the charming aspects of Okinawa to tourists using the experience and knowledge that I have acquired through working at a travel company,” Morita said.